There are a lot of small but important items to take care of around the home. A good example is the exterior faucets. Once the cold weather hits, many people don’t give much thought to these as they are not going to be in use for several months. But not protecting them against the cold weather can have consequences. There is a product called Faucet Sock that may prove to be valuable. 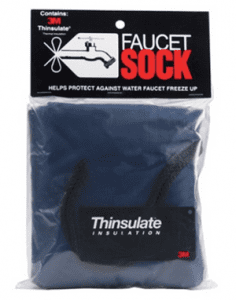 The Faucet Sock is a small insulator sock that fits snugly over your outdoor faucets. It provides just enough protection to keep them from freezing which could result in having to repair or replace them. According to the promoters of Faucet Sock, this is an easy to apply a product that is held snugly in place with string ties. The small size applies to the wall faucets. The hype for Faucet Sock is that many find that there is a need for this type of product. The commitment is really just a few minutes of your time. Which is all it takes to install the product. Some people turn their outdoor water supply off for the cold months. Then use the Faucet Sock to protect the faucet that is exposed to the elements. Our evaluation first indicated that there are a fair amount of people that are interested in a product like the Faucet Sock. It is all going to depend on the degree of cold weather that the faucets are exposed to as to whether a product like this is really needed. The purpose is to assist with the elimination of freeze-up of the faucet which can lead to some bigger problems. This is one of those cases where it may be better to be safe rather than sorry. We are prepared to give the Faucet Sock a Thumbs up. For some people, there is a need for it. Out of 210 customer reviews it has received a 72% five-star rating, and 20% have given it a 4-star rating. Although there are a few, who have had less than desirable results. A few have said it caused their faucet to freeze up. It may be in this case that there was a leaky faucet when the product was applied and the accumulated water did indeed freeze. It is important to thoroughly inspect the faucet for any leakage before applying the product. This product seems to be one that is small in nature, but those who have had issues with faucet freezing will testify to the importance of taking proper steps to help prevent freezing. There are other types of faucet products like those that are used for indoor uses. An example of this is the Waterfall Wonder which is a shower faucet attachment that changes the flow of your shower water. What do you think? Does Faucet Sock work or not?